Thanks for visiting my blog. Look for local news, reviews, town updates, some sports and general thoughts on parenting and education. Many of us would like a house that doesn’t require maintenance. Environmentally speaking, wouldn’t it be nice not to have to paint or to replace windows, roofs or shingles? There isn’t home construction that accomplishes that —but there was at one time. It was the Lustron house made of porcelain-coated steel panels. 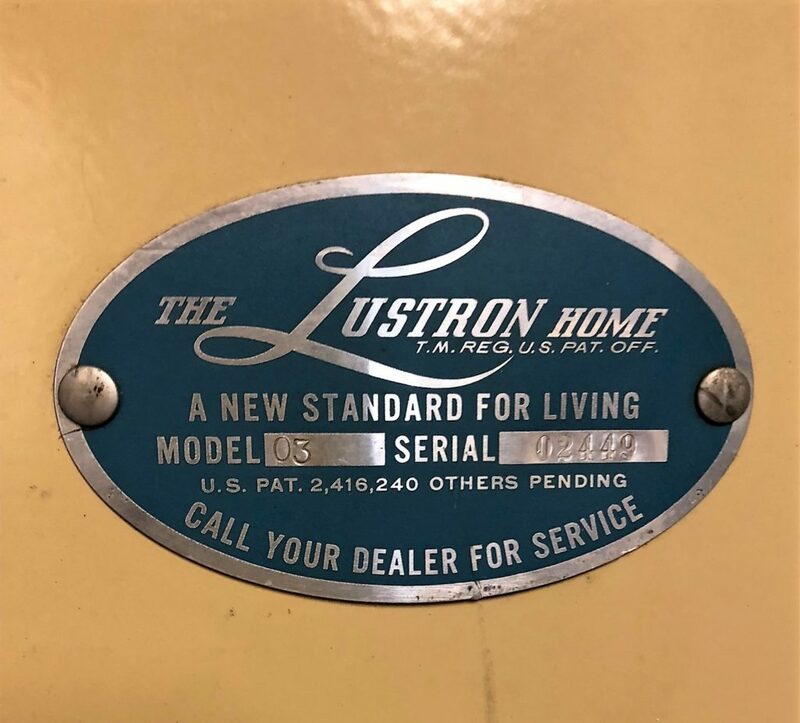 According to a 1949 Saturday Evening Post advertisement “Never before in America a House Like This,” the Lustron made maintenance a thing of the past. Other ads proclaimed the houses were fireproof, decay-proof, rustproof, termite-proof, vermin-proof and rat-proof. 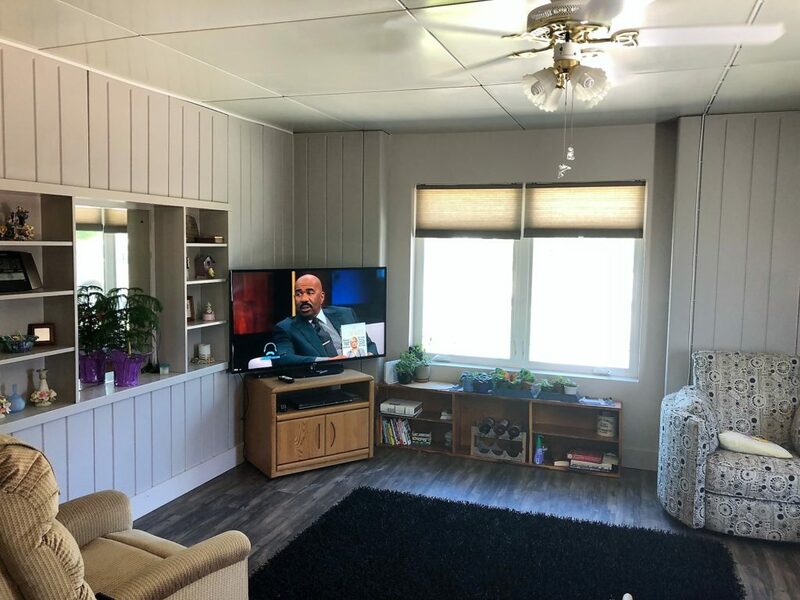 In 2018, many of the Lustron homes (only 2,500 were built) still have original siding and roofs and feature interior built-in cabinets. My mom moved to one about nine months ago. My mother, who turns 89 this year had lived alone in a four-bedroom two-story house in Mission, South Dakota. Her house was in the country on more than two acres of land and for many years after my father died, she was able to take care of the large property, gardens and house, but it was a huge task. My five siblings and I didn’t like seeing her live alone and worried that she might fall down the stairs with no way to contact anyone. We urged her to sell. Last summer, she agreed when a sister who lives in Martin (about 60 miles west of Mission), purchased and fixed up a home next to their residence. I went to visit and fell in love with my mom’s “new” three-bedroom, 1,140 sq. 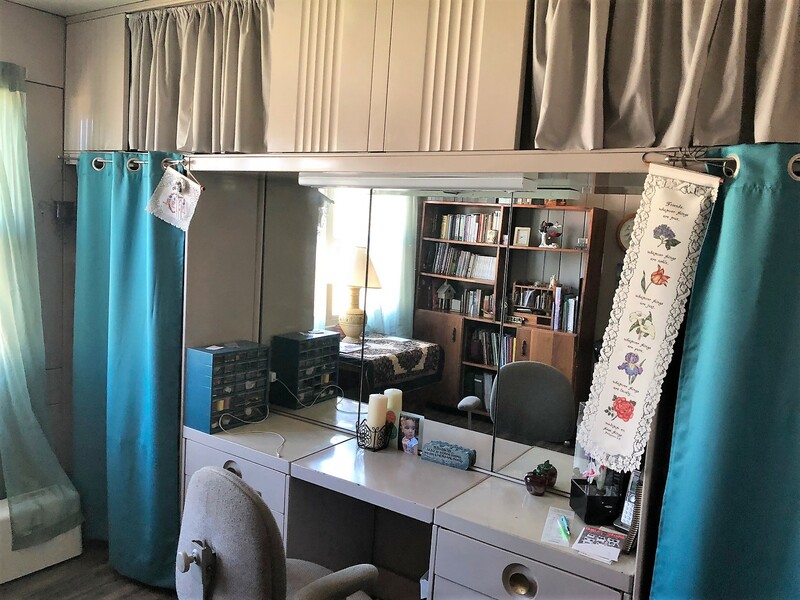 ft. Lustron Westchester Deluxe, with a built-in vanity in the master bedroom. Lustrons were a pre-fab house that came in three models: the Westchester, Newport and Meadowbrook and were available as two or three bedrooms. The exterior came in one of four colors: surf blue, dove gray, maize yellow and desert tan. Interiors were designed for ease of cleaning and the metal-paneled interior walls were most often gray. Carl Strandlunds came up with the idea of the home after World War II to address the housing shortage. The homes, which were constructed of 12 tons of steel and one ton of enamel, were prefabricated, ready-to-assemble and shipped in 3,000 pieces. The houses were mostly built on a slab, although some owners hired a structural engineer to put them over a basement. Strandlunds opened a company in Columbus, Ohio, where the Lustron home could be mass produced, much like automobiles. A typical Lustron has built-ins that account for about 20-percent of the total interior space. The rooms have pocket doors to eliminate space needed for a door swing. A utility room off the kitchen houses the hot-water and a hot-air furnace that heated the metal ceiling tiles, which then heated the whole house. The master bedroom included a built-in vanity and ample storage space. When my sister purchased the house, they added a “mud” room for my mom, who likes to garden, and replaced the floor tiles on the concrete slab. The rest of the home was still in good condition—and according to several web sources, this is typical of a Lustron—a house stands the test of time. Strandlunds began production in 1948, with houses costing between $6,000-$10,000. To break even, 50 houses needed to be produced a day, but only 26 were coming off the assembly line. According to Tom Fetters book, The Lustron Home, politicians questioned giving money to Strandlund, whose company failed to file required reports with federal lending agencies. Two years later, the company came under foreclosure. Only 2,680 houses had been completed, with 8,000 unfilled orders outstanding and a $37.5 million debt to the federal government. Strandlund couldn’t find alternate financing to continue production. Many believe that he fell victim to trade unions and the existing housing industry, who didn’t like the idea of a house that required no maintenance. The living room in the Lustron house is spacious and also includes built-in shelves. For many with environmental concerns, it seems that Pacific Palisades leads in the tear down of large homes to be replaced by even larger homes. There is almost never an attempt to recycle and most of the destroyed buildings end up in landfill. The upkeep on the large buildings with paint, varnish and replacement of wood is never ending. 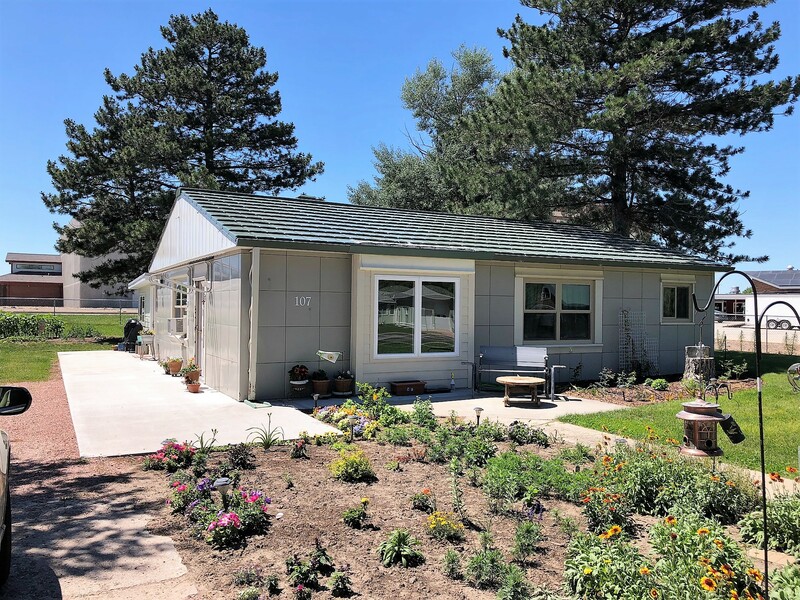 But the Lustron seemed to be a home before its time and something people, who are environmentally conscious might consider the future of home construction.